The extrageniculate pathway to the midbrain for reflex responses, and the hypothalamus for modulation of the day-night cycle. This article will consider the path of incident light, the photoreceptor mechanism and response of the retina to light, the central nervous system pathways for vision, and pupillary reflexes to light. Incident light first passes through the cornea to enter the eye, it moves through the anterior segment (aqueous humour) of the eye and passes through the lens, then through the posterior segment (vitreous humour) to act on the retina. Through the principles of refraction, the light rays meet the convex surfaces of the cornea and lens, and are angulated (via convergence) to a focal point on the retina. The cornea and lens are responsible for the refractive power of the eye, with the cornea accounting for most the refractive power but the lens crucially facilitating changes in the refractive power. Suspensory ligaments (also known as zonular fibres) attach the lens to the ciliary muscle of the eye and through contraction or relaxation allow changes in shape on the lens to increase or decrease the refractive power, which is termed accommodation. The function of accommodation is mediated by parasympathetic nerve fibres travelling through the 3rd cranial nerve, the Oculomotor Nerve. As light enters the eye the image formed is reversed and inverted. The left part of the visual field is detected by the right part of the retina and vice versa, and the upper part of the visual field is detected by the lower retina and vice versa. Understanding this relationship is crucial in being able to localise a lesion in the visual pathway. Fig 1 – Diagram showing the anatomy of the eye. Are inhibitory neurons that provide lateral inhibition – a phenomenon that increases spatial resolution (i.e. visual contrast). There are many functionally diverse subtypes that assist in interpreting visual signals before they leave the retina. Fig 2 – Diagram showing the arrangement of different classes of neurons within the retina. It is shown in diagramatic format and electron microscopy. 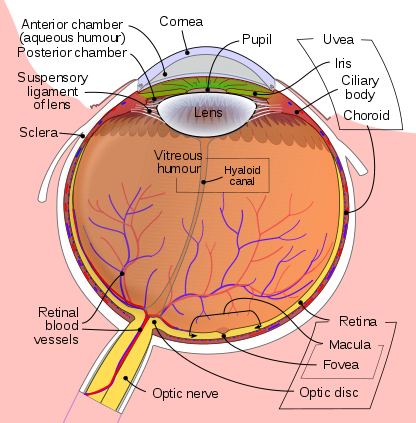 The cell bodies and processes of these cells are arranged into layers of the retina. 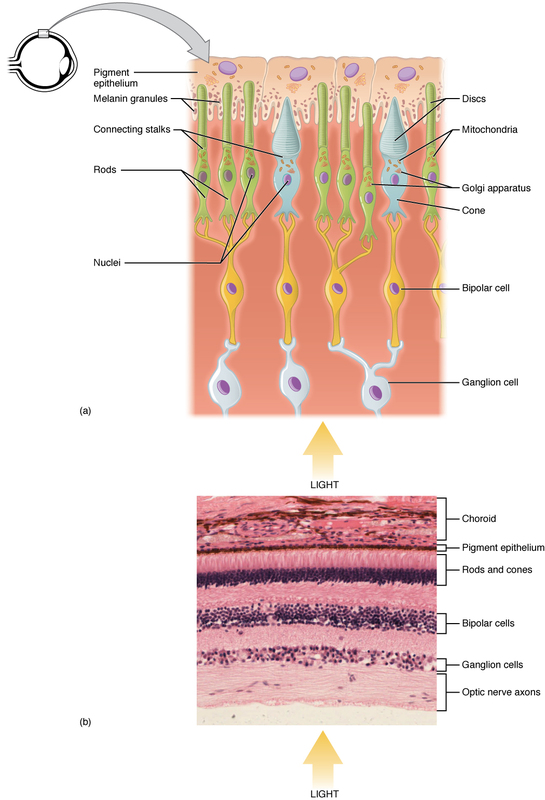 The simplest pathway in the retina is the three-neuron chain – photoreceptor cell to bipolar cell to ganglion cell. Rods are the predominant photoreceptor overall. They don’t detect colour and have relatively poor resolution, however they are far more sensitive than cones. Cones are sparse in comparison to rods, except in the fovea of the macula, where they are more numerous. This is particularly the case in the central fovea (foveola), where there are no rods. Cones detect colour and have high resolution, which determines visual acuity. 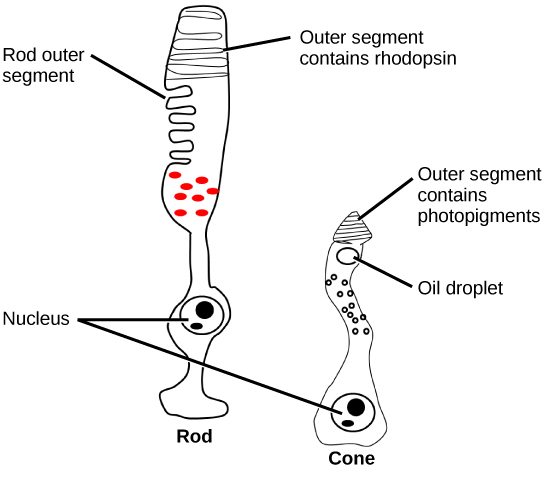 The rods and cones contain photopigment, which in rods is termed rhodopsin and in cones is termed photopsin­. There are 3 types of cones that contain the photopsin for either red, green or blue. These four photopigments have varying sensitivities to different wavelengths of light. Rhodopsin is a combination of the proteins scotopsin and retinal (which is derived from Vitamin A). When light energy meets rhodopsin it causes a conformation change in retinal leading to the active forms of rhodopsin. The activated rhodopsin then activates a G-protein called transducin. Transducin goes on to activate many more molecules of phosphodiesterase in a process of amplification. Fig 3 – Diagram showing the structure of rods and cones, including the location of photopigments. The eye differs from much of the central nervous system in that the retinal neurons produce graded potentials rather than action potentials. The exception is ganglion cells, which generate action potentials to be transmitted rapidly through the visual pathway. This mechanism is achieved due to the existence of cGMP-gated Na+ channels, which under resting dark conditions are open due to the presence of cGMP. This means that the resting photoreceptor cell is partially depolarised and is releasing neurotransmitters e.g. glutamate. The activation of phosphodiesterase, via the mechanism described above, results in cGMP being converted to GMP and therefore the cGMP-gated Na+ channels are closed. The cell becomes hyperpolarised and there is a reduction in the release of photoreceptor neurotransmitters. This reduction in neurotransmitter release leads to responses by the other retinal neurons, which ultimately leads to an action potential generated by the ganglion cells. An important feature of rods and cones is the capacity for light and dark adaptation. This is a process whereby if the person is exposed to light for an extended period much of the photopigments are reduced and some retinal will be converted back to Vitamin A for storage in the pigmented epithelium. Therefore, the sensitivity of the photoreceptors in reduced, and this process is called light adaptation. The opposite also occurs and is termed dark adaptation. Cones adapt much faster than rods, however rods have a much greater capacity for alteration in sensitivity. A third class of ganglion cell has also been described which is involved in the extrageniculate pathway to the hypothalamus (see below). These cells are photosensitive and contains a different pigment termed melanopsin. 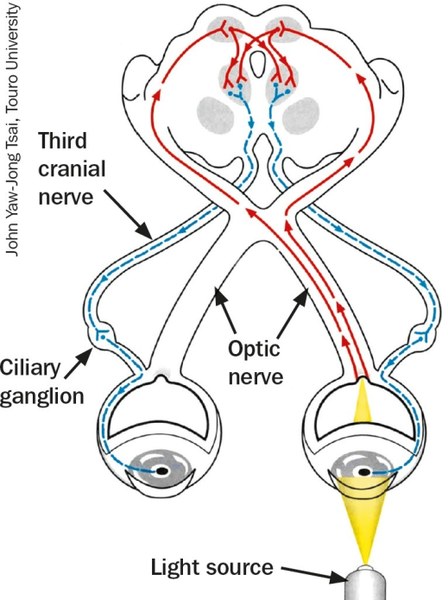 The axons from these ganglion cells pass through the optic disc to the optic chiasm. In the optic chiasm the fibres from the nasal half of the optic disc cross over to the contralateral side. This leads to the formation of the left and right optic tracts, which project to the Lateral Geniculate Nucleus (LGN) of the thalamus. From the LGN neurons project through the optic radiation, which sweeps around the lateral ventricle, to the primary visual cortex, located on the medial side of the occipital lobe. The fibres corresponding to the inferior retina loop around the temporal horn of the lateral ventricle on their path to the primary visual cortex, forming Meyer’s loop. This is the so called Geniculate Pathway for conscious visual processing. 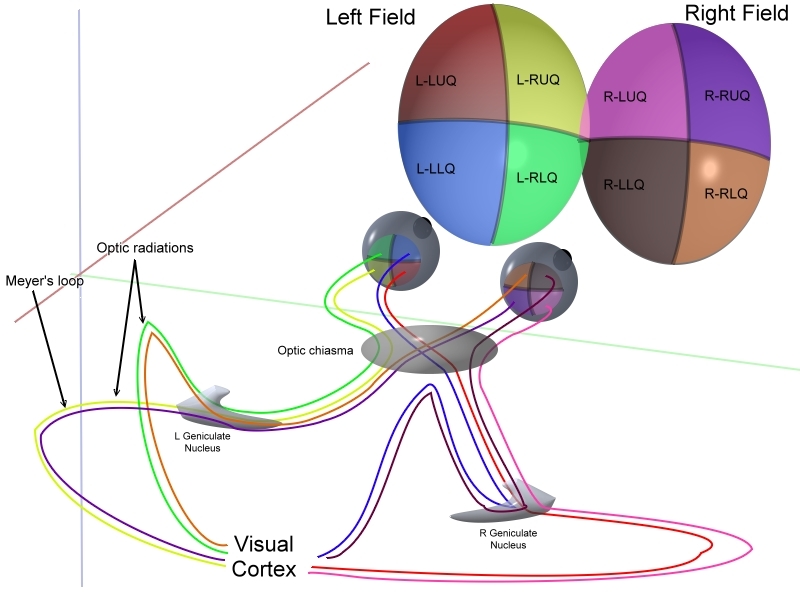 Fig 4 – Diagram showing the visual pathway from the eye to the primary visual cortex. The pathway of the visual fields is also shown in different colours. The Pretectal Nucleus of the midbrain – important in pupillary light reflexes. The Superior Colliculus of the midbrain – important in coordinated reflex head and eye movements in response to visual stimulus. The Suprachiasmatic Nucleus of the hypothalamus – important in regulating day-night cycles, the circadian rhythm. The pupil is innervated by both sympathetic and parasympathetic nerves, which act to cause dilation of the pupil and constriction of the pupil respectively. This reflex is mediated by the pretectal nucleus of the midbrain. The muscular components of the iris resulting in these pupil changes are the circular fibres (sphincter papillae) and the radial fibres (dilator papillae). The fibres from nasal part of the retina cross to the contralateral optic tract at the optic chiasm, whilst the fibres from the temporal part of the retina remain ipsilateral. This means that the fibres from each eye project to both the right and left pretectal nucleus. In the parasympathetic pathway, the pretectal nucleus projects bilaterally to the Edinger-Westphal Nuclei. The preganglionic neurons travel through the Oculomotor Nerves to the Ciliary Ganglion where they synapse. Then the postganglionic neurons act on the iris to constrict the pupils. The result is that if light is shone in one eye it will result in constriction of that pupil (a direct response) and will also result in constriction of the contralateral pupil (a consensual response). Fig 5 – Diagram demonstrating the parasympathetic pupil response. In dim light sympathetic neurons are stimulated in the cervical vertebrae. The first order neurons project to the ciliospinal centre (C8-T2) and emerge at the T1 level. The second order (preganglionic) neuron then loops under the subclavian artery and ascends within the sympathetic trunk to the superior cervical ganglion. Then the third order (postganglionic) neuron travels through the carotid plexus and cavernous sinus, before providing innervation to the dilator pupillae muscle. It is important to be aware that pupil dilation is a combination of both increased sympathetic stimulation and reduced parasympathetic stimulation. 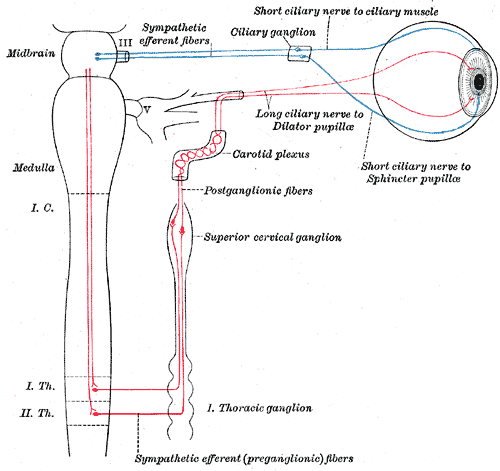 Fig 6 – Diagram showing the sympathetic pupil pathway. Homonymous Hemianopia is a loss of half of the visual field on either the left or right side. Using left visual field loss as an example – this requires loss of the left sided temporal field and the right sided nasal field (i.e. the left eye nasal retina and the right sided temporal retina are affected). Due to the nature of nasal fibres crossing sides at the optic chiasm, this localises a lesion of this type beyond the optic chiasm (i.e. the optic tract or optic radiation) on the right side of the brain. Fig 7 – Diagram showing the visual field loss in homonymous hemianopia.